There are many reasons to learn about making solar power a part of your energy plan. Federal tax and State utility incentives can make solar power an attractive option for those looking to lessen their carbon footprint. Some customers want to combat climate change and some just want to outfit their house with the latest technology in energy solutions. No matter what your reason for exploring solar power, it is important to work with a reputable company. 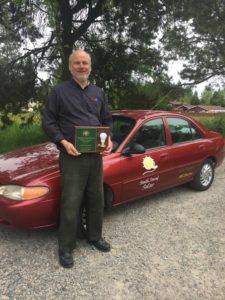 As founding members of the Solar Installers of Washington, South Sound Solar is a pioneer in the solar industry with a reputation for integrity. Kirk became interested in solar energy as a student in high school. He attended The Evergreen State College and became a math and High School science teacher. He worked for Intel in Dupont but he never lost his interest in solar. 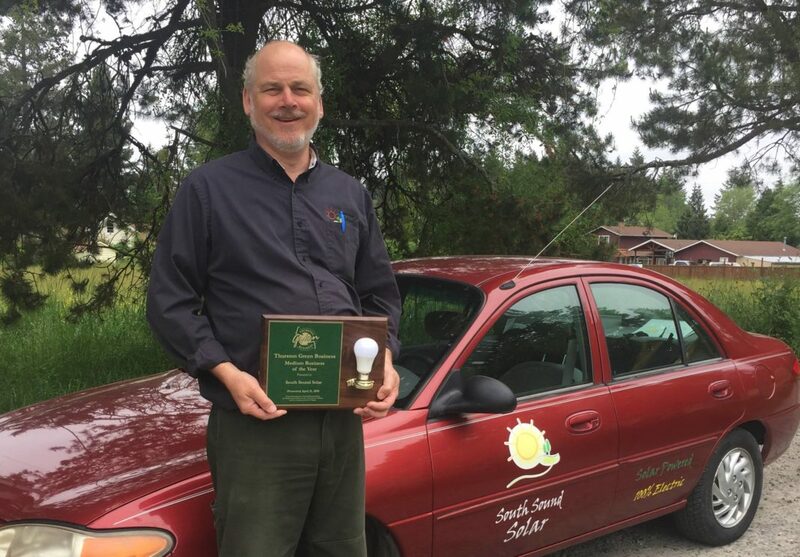 “When Washington State passed a law giving residents incentives for implementing solar in 2006,” he says, “I saw an opportunity.” He opened South Sound Solar in 2008 and recently they celebrated their 10th anniversary. 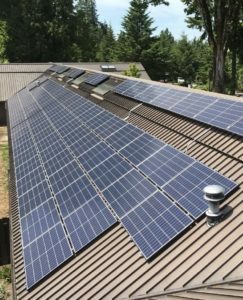 South Sound Solar has built installations at many of the local non-profit organizations such as the Thurston County Food Bank and the Sunshine House at Providence St. Peter Hospital. The Sunshine house provides affordable housing for the families of patients receiving care at Providence St. Peter Hospital. 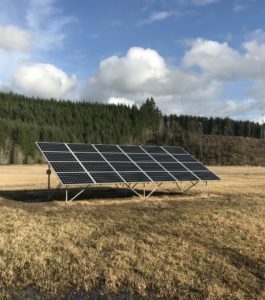 A hospital administrator used South Sound Solar to install solar panels at his own home and reached out to them for this project. “Providence received a gift to make building improvements to the Sunshine House and so we put together a solar design for them,” shares Kirk. The roof at the Sunshine House is a steep metal roof that required a very unique installation. Kirk’s master’s degree in physics helps him to make sure that each installation, no matter how complicated, is structurally sound. The South Sound Solar slogan is “We make solar happen.” Kirk has the expertise and knowledge to make solar happen at your home, but only if it makes sense. Their installation experts will provide a free consultation, which includes a site visit to analyze the home and where it sits on the property, inspect the roof area and talk with the homeowner about their budget and energy goals. “The bane of solar is not clouds but shade,” explains Kirk. Some homes have too much tree cover for solar, but options are often available on outbuildings, or ground mount systems They will never sell or install solar where there are too many trees, or if home energy efficiency improvements are a higher priority. The consultation also discusses energy efficiency with the homeowner. Sometimes the customer is referred to someone within their trusted contractor network to replace windows or add other energy savers before looking at solar power. South Sound Solar is a Tier 1 contractor with Puget Sound Energy (PSE), meaning that PSE trusts South Sound Solar to provide homeowners with a fair quote and a quality product. Buying from a local company ensures that they will be there to service the panels should issues arise, versus purchasing panels online or from an out-of-area contractor. “If you value supporting local businesses, find a solar contractor who lives in your area and contribute to your community,” says Kirk. Today Puget Sound Energy has over 600 solar customers in Thurston County, including private residences, non-profits, schools, churches, municipal buildings and farms. The Washington State legislature recently passed The Solar Jobs Bill, which provides a new production incentive and allows net-metering customers to use their solar credits as one-to-one replacement for grid energy. Excess generation during the dog days of summer continue to reduce your utility costs during the winter. Federal tax and State utility incentives are available to homeowners but understanding these programs and how they work is essential to avoid an unpleasant surprise at tax time. The professionals at South Sound Solar are very knowledgeable in solar incentives, as they were instrumental in passing these laws in Washington State. For more information, visit the South Sound Solar website and see if solar power is the right choice for your home or business. Previous articleChild Care Action Council’s Build Off Event Brings Fun Learning to Kids and Families.